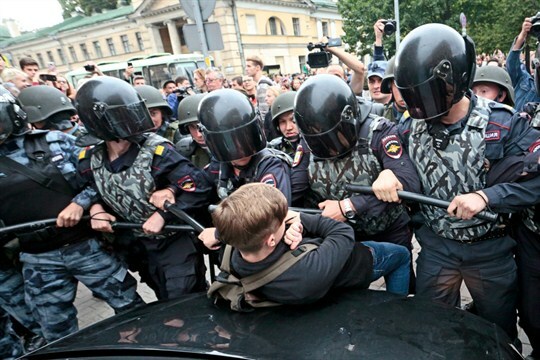 Russian police officers harass a teenager during a rally against increasing the retirement age, St. Petersburg, Russia, Sept. 9, 2018 (AP photo by Valentin Egorshin). In the wake of Russia’s aggression against Ukraine in 2014, the United States embarked on a two-pronged policy of sanctions and isolation to punish Moscow. At the time, some Russian analysts predicted it would be impossible to isolate Russia, and that those seeking to do so would only isolate themselves. That has proven to be right in more respects than those analysts and the Kremlin may have realized.